Ted and Joe knew each other through their knitting and their web logs, but they also had one other thing in common. They had both stayed at a retreat center in Upstate New York, called Easton Mountain. During one of their infrequent times together at the New York State Sheep & Wool Festival, Ted imagined out loud what it might be like to have a bunch of guys knitting and spinning at Easton Mountain, and that’s all it took to begin the process of establishing the first Men’s Knitting Retreat. 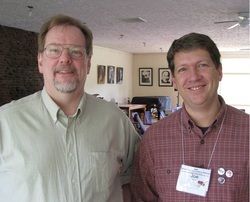 The first Mens’ Spring Knitting Retreat was held in May of 2008 and had 32 guys in attendance. The guys came from Canada, San Francisco, Florida, Pennsylvania, Maryland as well as from areas closer to the retreat center. In addition to the serenity and peace afforded by the venue, the guys reveled in the joy of being together with other like-minded men. It was quickly decided by all in attendance that the event would need to become at least an annual event. From that, the idea was sparked to have regional retreats in other areas of the country, and guys started asking how to go about having an event closer to where they lived. We put together an informal space to create a sort of umbrella organization to support any guys wanting to coordinate their own events, and to help publicize any events that take place.